Tumors may develop in any part of the nervous system. Such new growths may be benign or malignant. They may arise primarily or they may be a metastasis from a tumor of some other tissue. For this work they may be classified as intracranial tumors, spinal cord tumors, and nerve tumors. Intracranial tumors, as the name designates, are those within the skull. In this site primary tumors fortunately are not too common. They may arise from the brain cells, the meninges, the blood vessels, or adjacent supporting tissues. Tumors of the pituitary gland, cranial nerves, and other intracranial structures may produce the same effects as brain tumor. As with all tumors, the name of the type designates its cell origin and its cellular make-up; for example, meningioma is a tumor arising from a meninge and hemangioma means blood-vcssel-tumor. New growths in the skull may be benign or malignant, but because of the location in this vital area, a benign tumor may have “malignant” effects. A brain tumor of any type may produce gradual compression on a brain center as it grows. The symptoms of brain tumor are ex­tremely variable but correspond to the specific centers involved; symptoms are general and local, but the specific location can usually be ascer­tained by aforementioned diagnostic procedures. Malignant brain tumors may arise as a primary neoplasm in the brain, or they may be metastases from other malignant tumors in the body which have spread to the brain. Metastasis to the bony skull can also encroach upon the brain, simu­lating brain tumor. In some cases of malignant tumor of adjacent tissues about the face and the base of the skull there can be erosion into the brain by direct extension of the uncontrolled growing mass. Treatment of brain tumors rests with surgical removal or x-ray treatment or a combination thereof. Operation entails craniectomy and com­plete removal of the tumor with destruction of as little normal tissue as is possible. Unfor­tunately, by the time operation is accomplished in many cases, the disease has progressed so far that removal of the mass would not be com­patible with life; that is to say, the tumor is in­operable. Thereafter, treatment is palliative to alleviate symptoms and provide maximal com­fort. Spinal cord tumors basically involve the same considerations as brain tumor. The cord is en­cased in the rigid spinal canal and any enlarging tumor compresses it. The symptoms and effects depend on what tracts in the cord have been destroyed or compressed. Tumors of the spinal column, primary or metastatic, may produce the same effects as intraspinal tumors. They may in­volve the sensory tracts or motor tracts or both; i.e., pain, loss of sensation, or paralysis. Symp­toms vary, but the site can usually be determined by diagnostic tests. Spinal puncture for study of the spinal fluid and myelography are most es­sential. Spinal cord tumors may be benign, malignant, or metastatic. Treatment of spinal cord tumors rests with laminectomy at the specific level and removal of the tumor mass with the least destruction of spinal cord tracts as possible. X-ray therapy may be used for treatment or as an adjunct to surgery. Tumors of the peripheral nerves may de­velop at any site along any nerve. There are sev­eral types, commonly referred to in general as neuromas. They may produce the symptoms of pain or other sensory changes, or disturbances of function. These nerve tumors may develop from the nerve fibers themselves or from the sheath of the nerve. Peripheral nerves may also be involved with tumor of an adjacent structure which grows against or into the nerve. Metastatic growths may spread to a nerve. Primary neo­plasms of nerves may be benign or malignant, the former predominating. A specific type of peripheral nerve tumor is that which arises from the nerve endings, the glomus tumor. This commonly develops in the fingers and toes, usually beneath the nail, and produces severe pain. Treatment is surgical. New growths of nerves may be single or mul­tiple. In the affliction known as von Reckling­hausen’s disease the tumors are numerous, often several thousand in number. The tumorous nodules can be seen all over the body along the course of nerves. Those which are large, painful, or disabling are treated surgically. Neuromas often develop in ends of nerves which have been severed, apparently by the nerve’s attempt to regenerate. These are fre­quently present in amputation stumps at the end of an amputated nerve. They may produce a symptom referred to as “phantom pain,” where pain and other annoying sensations are felt in the missing amputated part. 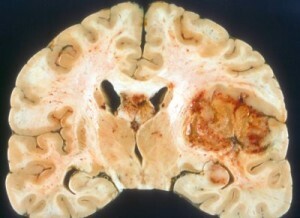 Apparently the tumor initiates sensory impulses which are trans­mitted up the nerve to the sensory centers of the CNS. Sometimes injecting the tumor with a de­stroying substance will alleviate the symptoms, but more often they will have to be surgically removed — i.e., by re-amputation of the nerve ending. Operative removal of a tumor entails approach to it through incision, which may be in any area of the body. In some instances the tumor may be shelled out of its bed in the nerve fibers. In other instances removal of a segment of a nerve is necessary, in which case the nerve is re-united.